Ms. Meserve’s nominator says, “She does not hesitate to follow up with colleagues and students to ensure tasks are fully executed. Anyone who visits the music office receives the highest quality of care and service from a truly high-quality individual. Fran is particularly adept at making sure all the ‘behind-the-scenes’ operations of our unit run smoothly…. The students, the people to whom we dedicate our efforts, also benefit tremendously from Fran’s skill set, keen intellect, and warm, genuine personality.” Ms. Meserve is recognized for her creative problem-solving skills and commitment to anticipating and meeting needs. 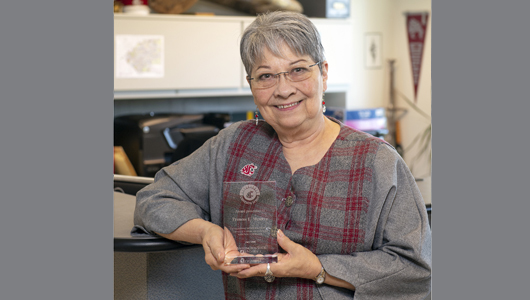 For more information about other Crimson Spirit Award recipients or to nominate a WSU employee, visit go.wsu.edu/CrimsonSpirit. Top image: Meserve in the School of Music main office.